Jazzee is an open source, multi-campus collaboration. It is designed to provide the structure for campuses, departments, programs, and individual specialties to define completely custom online graduate applications with minimal developer intervention. Jazzee has been in use at UCSF since Summer 2009 and was deployed at Berkeley in Fall 2011. It is a completely open source project with a BSD license and is now under the guidance of a multi-campus governance organization made up of users, developers, and administrators at UCSF and Berkeley. We are actively seeking to collaborate with other campuses as they seek to upgrade their existing systems or replace expensive vendors. Jazzee 2.0 was deployed at UCSF in the Summer of 2011 and is under active development. 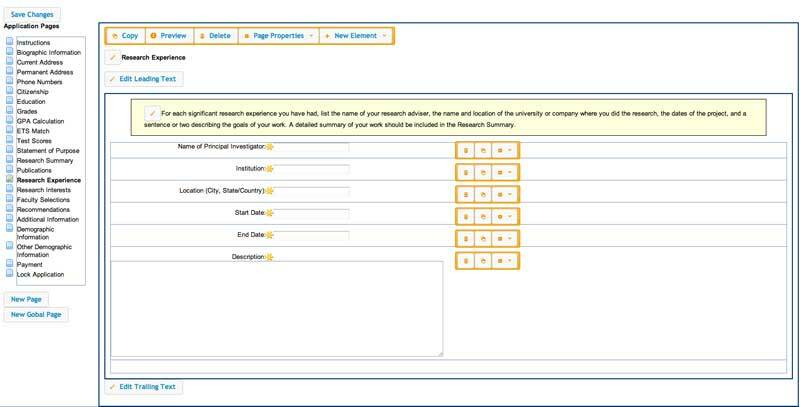 Using a simple interface individual users can create very rich applications which incorporate campus required and program specific questions into a seamless applicant experience. This allows campuses to deploy custom applications for every type of applicant without needing to engage an army of developers to constantly modify the interface. Jazzee frees users from the minutia of web design, application security, and database schemas. With a brief introductions and a few clicks of the mouse users are able to create rich online applications which meet the needs of admission committees and registrars alike. Programs spend far more time word smithing the specifics of applicant instructions and debating the merits of GRE scores than they do actually creating an application. This is a very different experience from working with a distracted developer who has no desire to provide 20 iterations of the instructions page for the faculty to review and is concerned with reusing existing templates and not adding significantly to their maintenance load. Jazzee is built from the ground up to be extensible without diverging from the main source tree. Each campus can add special page types, unique elements, and custom styles without ever modifying Jazzee. This is a bottom up design decision which will keep the campuses using and developing Jazzee together without needing to understand each others customizations or fork the entire project until it is too divided to be called a community. Program administrators build their application in the page builder. It is a web 2.0 style interface where elements can be rearranged by dragging, deleted with the click of a mouse, and created from scratch all without ever knowing what a form tag is or understanding why Internet Explorer 6 floats fieldsets incorrectly. If you are not afraid of the bleeding edge you can clone the current version straight from our git repository. It's not recommended for public use.